Tree houses, neon lights, robot sculptures and all-white rooms reminiscent of outer space: these loopy lodgings definitely can’t be found at your local Holiday Inn. 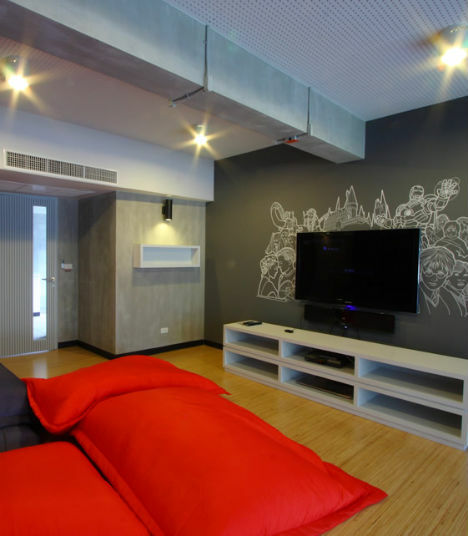 And why settle for a bland everyday room when you could have a totally one-of-a-kind respite designed by a local artist or even an internationally renowned architect? 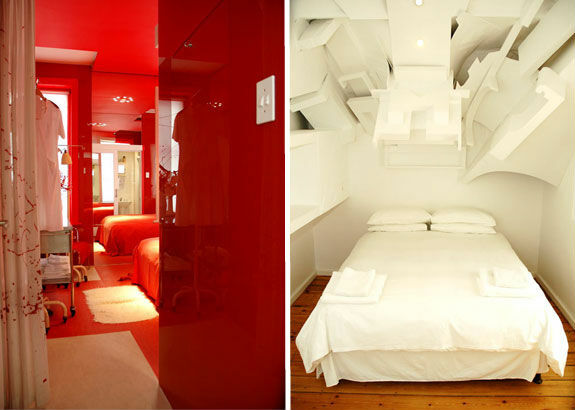 These 20 rooms at 6 hotels around the world are in a (weird but wonderful) class of their own. 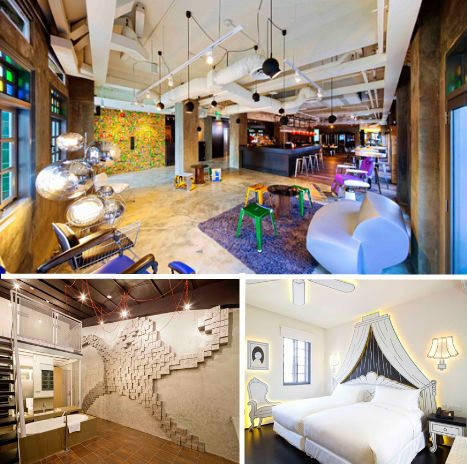 Try to conjure up the most incredibly creative, artistic hotel rooms you can possibly imagine, and they might very well look something like the real-life rooms of the Wanderlust Hotel in Singapore. Each room at the Wanderlust is like an art exhibit at a gallery, as different from one another as if they were created by a diverse team of designers – and that they were. From the ‘industrial glam’ lobby you’ll walk up onto a first floor filled with bright neon capsule-like rooms, a second floor with similar neon rooms named for color-related songs, and a third floor featuring black-and-white rooms as well as stunning origami-themed rooms where every element, from the ceiling fan to the headboard, appears to be made from folded paper. On the top floor, ‘Creature Comforts’, is an incredible array of surreal rooms including one that looks like a modern tree, another with a huge monster on the wall and yet another with a couch that looks like an overgrown typewriter run amok. 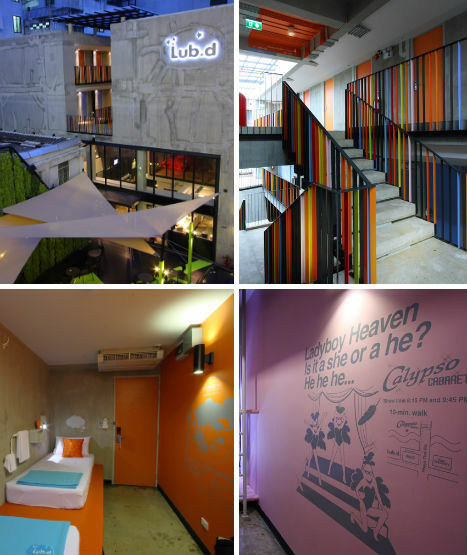 Vibrant colors and quirky murals give the Lub D Hostel in Bangkok the look of a high-end boutique hotel on a shoestring budget. Bare concrete surfaces and exposed ducts that would otherwise look drab take on a stylish industrial look when paired with modern furnishings and solid blocks of vivid paint. 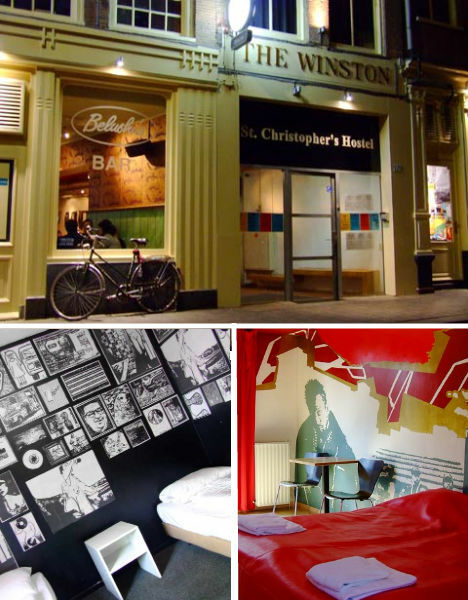 You’d never guess from the staid exterior of The Winston in Amsterdam that this hotel & hostel – which also has its own bar and club – contains such wildly creative rooms inside. Or perhaps you would, if you realized you were in the city’s notorious Red Light District. 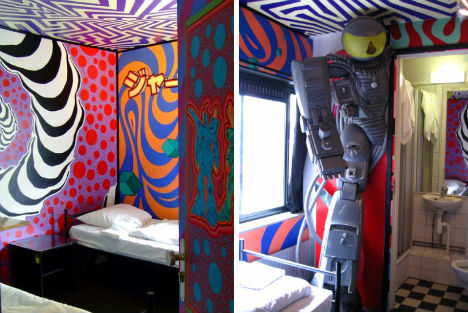 The Winston is a budget art hotel where every room is unique, including one with a bizarre transformer-like robot mounted on the wall and a child-like room appropriately called the ‘Playnation Room’. The bathroom in the hotel’s club even has its own mini art gallery. 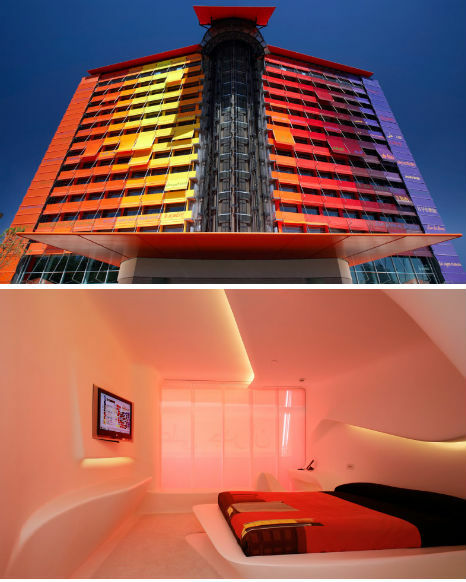 You know that the Hotel Puerta America in Madrid is something special before you even walk in the door. The exterior is encased in brightly colored cladding printed with the poem ‘Freedom’ by Paul Ellard. But that’s nothing compared to the showcase of international design talent found inside. 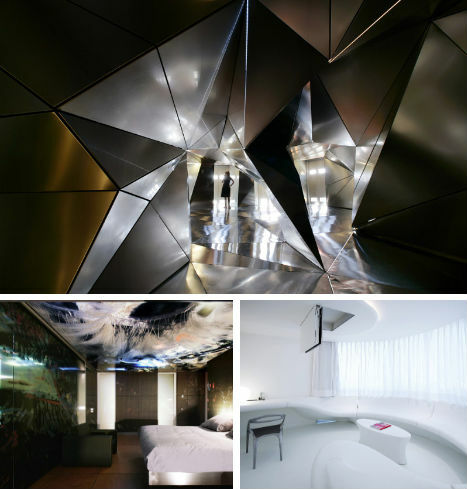 Each of the 12 floors of this new boutique hotel was designed by one of the world’s most sought-after architects including Zaha Hadid, David Chipperfield, Normal Foster and Jean Nouvel. Ascending from one floor to the next, one encounters jarring shifts in color and mood, shifting from Chipperfield’s toned-down monochromatic luxury to faceted stainless steel to Italian opulence. Marc Newsom’s sixth floor is practically vampiric with its red lacquer, white marble and black furniture while Ron Arad takes the seventh floor to a futuristic, almost space-like place with curved white Corian. Interactivity, Japanese minimalism, industrial cement and zebra-striped formica walls are just a few of the other themes included in the eclectic mix. 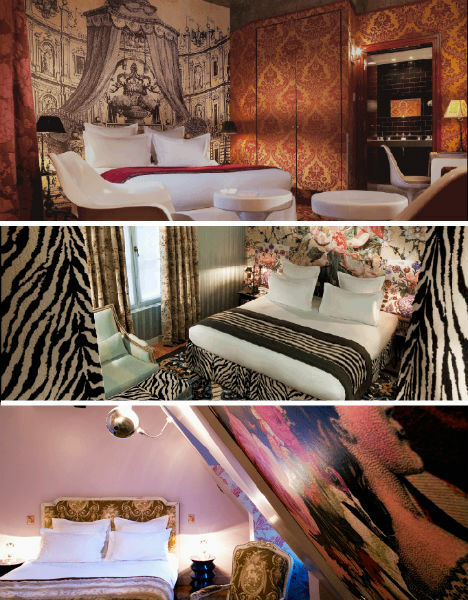 Designed by Christian LaCroix, the Hotel du Petit Moulin in Paris embodies the style of the renowned clothier and of the city itself. Whimsical and feminine, the boutique hotel is located in a former 17th-century bakery and packed with toile, beading, intricate illustrations and luxe fabrics. 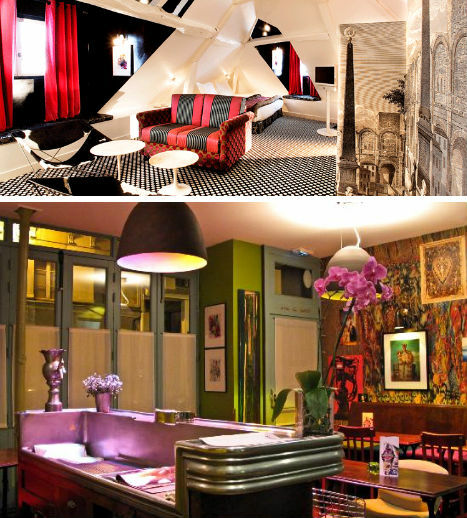 Each of the hotel’s seventeen rooms offers a different way of experiencing the district of Le Marais in which the hotel is located, according to the designer. 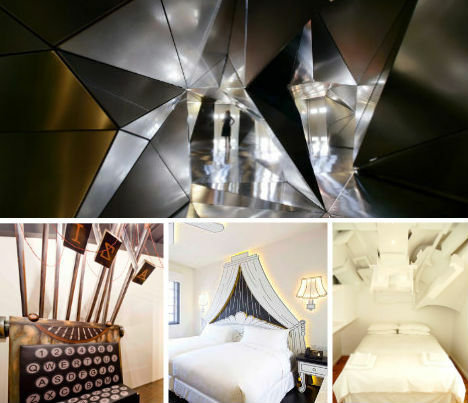 Staying at the Daddy Long Legs Hotel in South Africa is like being part of an interactive art exhibition – and that’s exactly what the hotel believes many travelers are looking for. “They are independent, creative, forward thinking travellers….. who don’t want to stay in another regular hotel room in another regular city on another regular holiday.” No danger of that happening here. 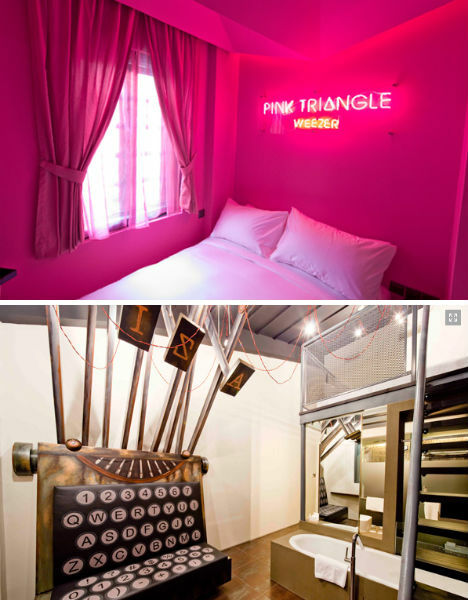 The hotel has 13 rooms designed by 13 artists, each with their own creative theme. The Emergency Room resembles a blood-drenched hospital suite with an IV stand and a nurse’s uniform hanging on the wall, but it’s anything but sterile (and doesn’t smell like a hospital, so they say.) 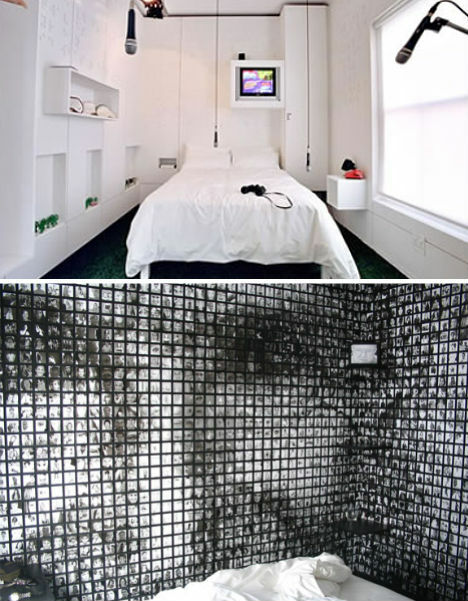 Graffiti artist Mak1One designed a highly unusual 3D wall sculpture above the bed in the ‘Being Mak1One’ room, and in ‘The Photo Booth’, 240 images by Antony Smyth create one large portrait.